These are the best of the tales—some as they were originally published, some expanded and reimagined. Ranging from social satire to the paranormal, from fight to flight to friendship, these stories touch base on the encounters of the human experience. Benefits – A new home is all about location. And what you dig up. Food Chain— Wildlife documentarians Owen and Nate are in search of a new challenge. But sometimes the largest challenges turn out to be very small. The Logo Men— What if the Seven Deadly Sins walked into a bar, and nobody noticed? Rinse, Repeat— All the days are the same now. All because of one date. Perfect— Sometimes life is as transformative, and as simple, as a holiday gingerbread cookie. The Tin Foil Hat Society — It’s time for the millennial alien visitation! What could possibly go wrong? …and other tales of wonder and terror. 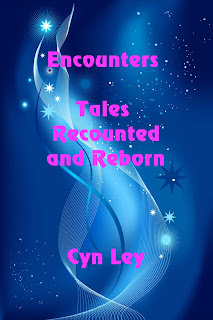 A top reviewed author on Amazon, Cyn takes much of her inspiration from the part of the beautiful Pacific Northwest she calls home, where fire (the active volcanos) and water (the many rivers and the Pacific Ocean) actually do mix. Among her many interests are history, embroidery, folklore, and things that are generally rather strange. The best of her earlier writings (2014-2016) were revised and given new life in the collection Encounters Tales Recounted and Reborn, published in spring 2017. A number of them had made previous appearances in various Solstice seasonal anthologies and smaller collections. This was followed in early fall with an anthology of all new stories, most of them paranormal, entitled The Ossuary Playground and Other Unexpected Tales. Shortly after, the story Plot Twist found its way into the annual Solstice fright fest anthology Now I Lay Me Down To Sleep Volume 5. It is now available as a stand-alone story on Kindle. In addition to her writings, she was named the 6th top book editor in the 2016 Predators & Editors poll, and advanced to 4th place in 2017. All of Ms. Ley’s titles are available on Amazon.com.